Whilst staying for a day at the Ideal Beach Resort I visited Vedentangel bird sanctuary, about an hour's drive away. The roads vary between smooth highway and rough backroads and run through towns and villages, areas of open stony ground and paddyfields. Close to the hotel we saw White-throated Kingfisher, Black Drongo, numerous Indian Pond Herons and Little Egrets and House Crow. On a telegraph pole I saw a small fluffy-looking raptor which turned out to be a Black-shouldered Kite (a trip highlight for me). Further into the countryside we added Plain Prinia, Baya Weaver, Red-vented Bulbul and Rose-ringed Parakeet. A brief stop near a pond with Water Buffalo in it added hovering Pied Kingfisher and Black-bellied Terns. As we left we realised we had an audience of about 30 locals, seemingly wondering what on earth we were up to. Another stop by paddyfields added another Cinnamon Bittern and three Paddyfield Pipits. When the terrain became drier we saw Hoopoe and Shikra. 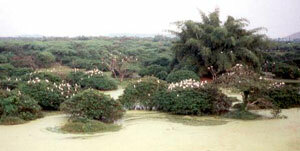 This bird sanctuary is well signposted from about 15 kilometres from the entrance. It is an area of flooded forest, open water and adjoins farmland and paddyfields. There is a visitors centre with pictures of some of the birds one might see there. There are a few concrete towers which act as hides overlooking the water and trees. The trees closest to the water held many Asian Openbills, Little and Indian Cormorants, Grey Herons, at least three Indian Darters, a few Black-crowned Night-herons, Black-headed Ibis, Little Egret and Great Egret. One White-breasted Waterhen was found feeding beneath these trees and a Common Hawk Cuckoo flew close by. On the water were Spot-billed Duck, Northern Pintail, Northern Shoveler, Common Moorhen and Little Grebe. A hundred metres further on, from the second tower, we watched a juvenile Spot-billed Pelican. Whilst sitting by the end of the lake, listening to Asian Koels, a huge-looking Greater Coucal flew up from the ground, Asian Palm Swifts flew and called overhead and an Indian Pond Heron fed in the shallows. The telegraph wires running over the farmland and paddyfields held White-throated Kingfisher, Indian Roller, Spotted Dove, Common Myna, Rose-ringed Parakeet and six Green Bee-eaters. In the fields were numerous distant egrets, three Red-wattled Lapwings and another Greater Coucal. Also here was a party of Yellow-billed Babblers with very obvious pale heads.